In our new to us home, it's been taking a lot of time to unpack all the craft items. Especially with all the hurdles we've had with losing our dogs and my sister. At the old place, I had a sewing desk down in the basement near the quilting machine. Additionally, there was one upstairs where I had all my paper craft items. 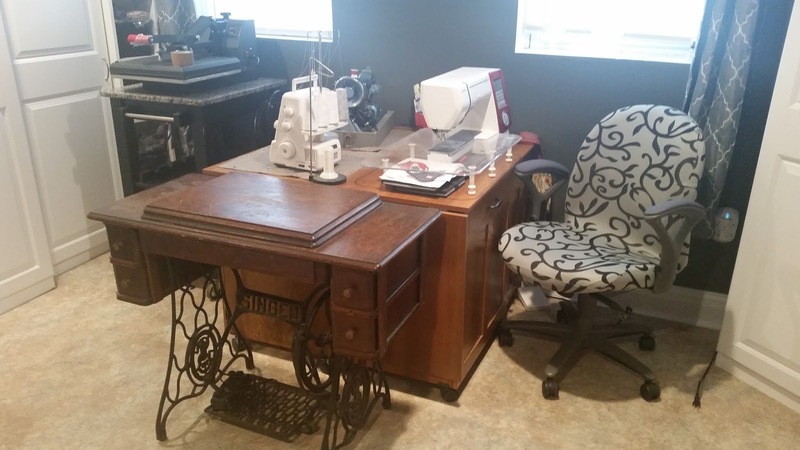 So, in the craft area downstairs, I wanted to place both sewing tables. I'm always a person that places everything around the edges of the room. I thought this time, I wanted to towards the center. So, I placed both sewing tables back to back and placed them under the windows. I then forgot I had the antique Singer treadle machine. So, I placed it on the edge of the sewing tables. It makes it difficult to expand the sewing tables. However, in the past, I didn't open them up much in the first place. So, here is my sewing area. I probably haven't sewn anything in over a year plus. Today, I was determined to do something on the sewing machine. 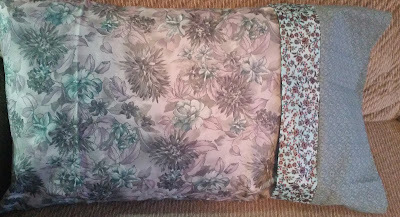 So, my husband has been after me to make a pillowcase for the mypillow travel pillows. So, instead of starting from scratch, I took a pillowcase that my sister made me and cut it down to fit the mypillow travel pillow. I'm very pleased with it. It's only been a month since she passed. You don't realize how much you appreciate homemade gifts until they are no longer with us. Here's the pillowcase. She made me several sets so this will get more use. It's a start hopefully bringing me back to sewing.